Paul Cornell is well known to Whovians but has also written some impressive titles for the comic world too. These include Action Comics, Batman and Robin, a couple of mini series in the Dark Reign crossover, and my personal favourite Knight and Squire. Upon this life changing Wolverine crusade is Alan Davis, who is a stalwart of classical comic artistry. He has been drawing mainstream titles since the eighties and many of my Uncanny X-Men books from my teenage years. Interesting both creators have spent time with the Captain Britain book, reflecting their nation of origin. As discussed in my recent post, Paul Cornell’s changes to the Wolverine character are radical and frankly welcome. The Killable arc begins with a weakened Logan attempting to confront his archenemies without his healing factor. It was taken from him, or genetic rewritten out of him by a virus from the microverse. 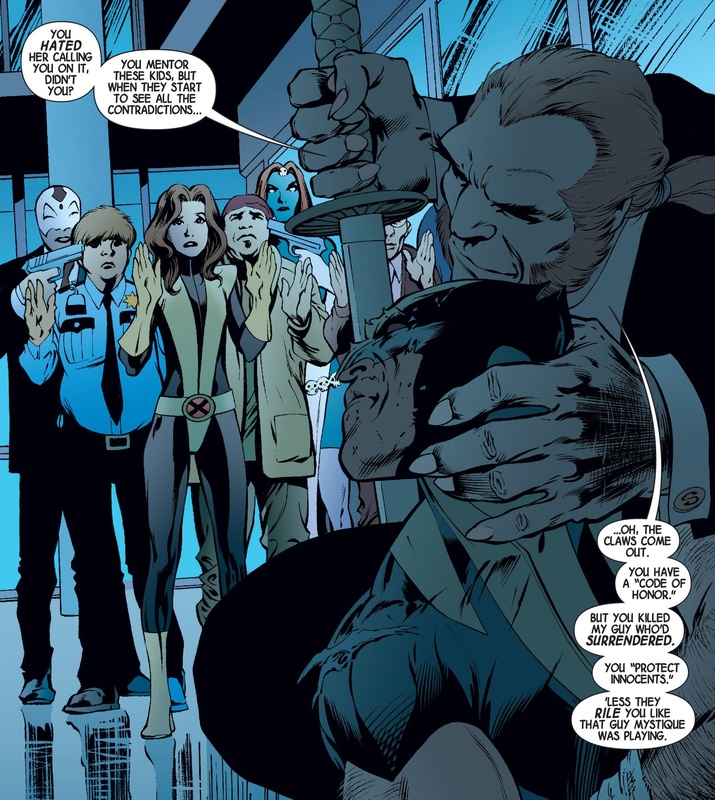 There is a conspiracy to capture Wolverine by Sabretooth and Mystique, and doing so they purposely bring about reactions that will serve to show Wolverine’s true character: He endangers civilians, friends and in a fit of rage, injures an innocent man. As he lies there, brought down by Sabretooth, we begin the trial of the Wolverine. Paul Cornell’s writing is simplistic but quite nuanced in places, especially with Sabretooth’s revelatory monologue. His Wolverine is classically stoic but quite emotional and believable because of the scenario he is placed in. As Creed’s proclamations escalate, Logan’s rage crescendos to the point where he drops helplessly, whimpering pathetically. It is rare to see him like this but completely befitting of the story Cornell is trying to tell. The narrative is somewhat complicated with filler of an alien virus and Shield’s involvement, but that aspect of the story serves only to provide Wolverine a semblance of morality: a water drop in a ocean of guilt and sorrow. 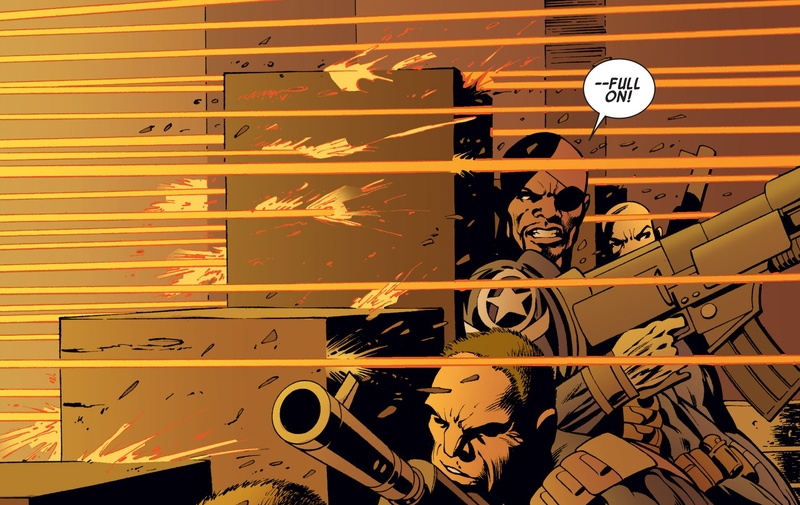 It does serve for some great displays of action and explosive ballistics on the page. Alan Davis art accompanies the reactions at hand, in that his faces are clear in motive and emotion, especially the eyes. The look upon Wolverine’s face when the truth is revealed is wonderfully despairing and resigned. It persists through the final pages and I imagine this will be a continuing theme through the next incarnation of the book. There is no surprise to the ending to this story, because we all knew his healing factor was not returning. There were even hints to the idea of him becoming a villain, so we knew something was going to change, affecting him deeply. 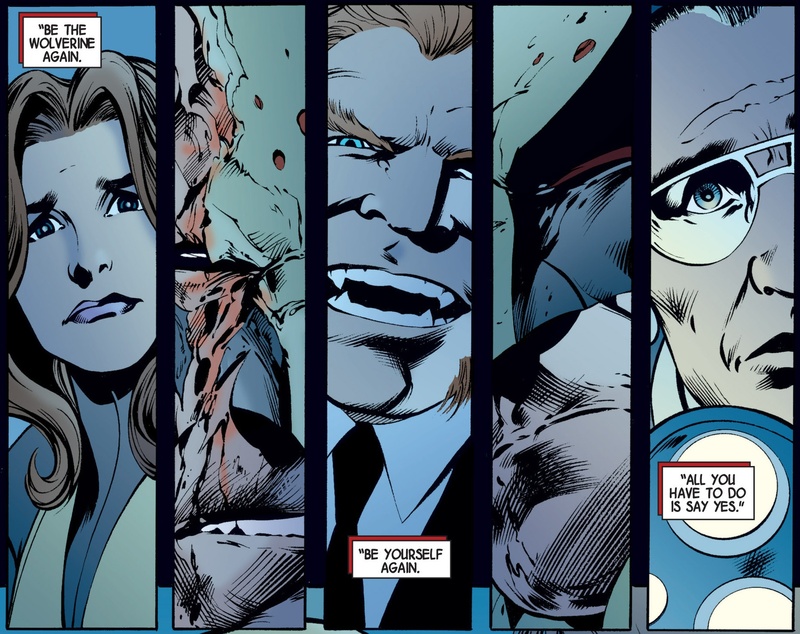 If we think about this carefully, we can go back to Logan killing his illegitimate children, murdering Mystique and Sabretooth, going to Hell, killing his son more than once and letting down X-13. These events are all on a large enough scale to allow Wolverine to reflect upon his life and change the person he is. It can be debatable but I would argue that he continues to be his same old self, despite these atrocities. The recent events where he is a headmaster of a school is a quaint idea but not in keeping with the rest of his character in other books. Paul Cornell does something completely different, he brings back Wolverine’s enemies in order to humiliate him and make him suffer in a way he never has before. In losing his healing factor, it means he is no longer a threat and eminently killable. Sabretooth’s dialogue is extremely derogatory but excellent in summing up my thoughts on Wolverine. Time has run out for our beloved X-Man, and his past has come back to seek revenge. Of all the trials and tribulations of Logan’s life, it is losing his healing factor and exposing his weaknesses, again, that brings about desolation. I am very impressed with Cornell in maintaining his resolve in transitioning the character, all from events that are not as apparently significant as previous escapades. Wolverine’s time has come, that time is NOW. Previous PostThe Theatre List 8/1 – Yep that is right, No Avengers or X-Factor!